I just realized this morning that Easter is less than two weeks away! How did that happen? 2015 has really been flying by. Luckily school started back up today, so I had time to whip up an Easter freebie for you all. 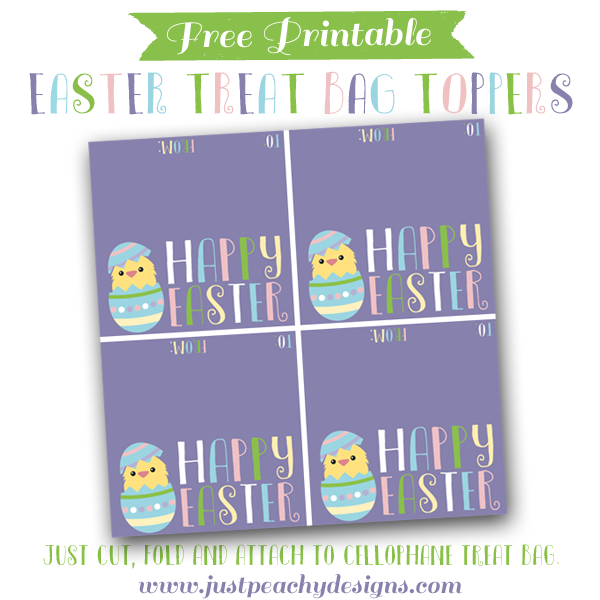 Here's a set of 4 4x4 inch printable toppers that are perfect for presenting treat bags full of jelly beans, Cadbury eggs (the minis are my favorite) or whatever Easter treat you choose. They feature an adorable baby chick graphic from Freepik.com. Isn't he precious? Just click the image above to download. Print, cut, then attach to a 4 inch treat bag. Happy Easter! For more Easter freebies - including printable gift tags, digital papers and more - just follow this link.